Seen Through a Glass: Bring it on, Jack me boy! If you aren't thirsty...don't bother coming. Uncle Jack and I were contacted by John "Latent Homebrewer" Trogner and Ed "Music Man" Yashinsky at Tröegs. 'Look,' they said, 'you guys are always snarling at each other. 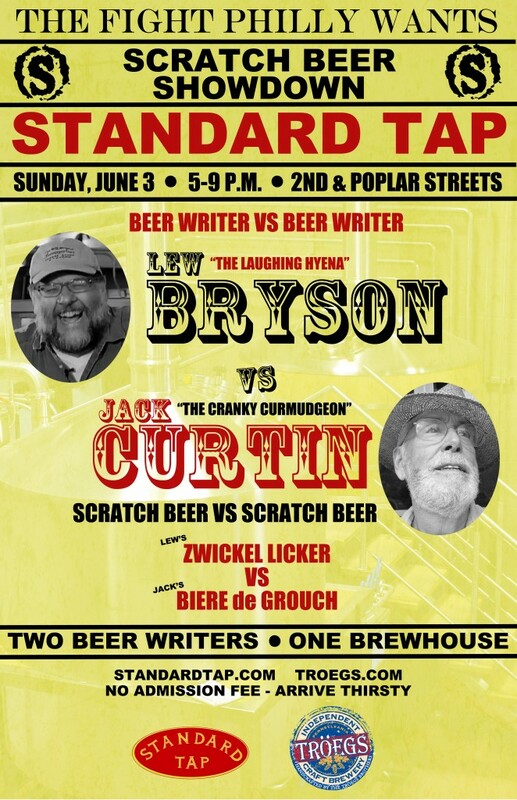 Why not settle it with a Scratch Beer showdown? Both of you come up to the brewery, sit down with our brewers, and we'll brew what you come up with for a head-to-head grudge match during Philly Beer Week?' Kind of like the Royal Stumble, only with just the two of us, mano a mano (the tap-working hand, that is). So we did, and we invite you to come out to Standard Tap for the fun, 1st Sunday of Philly Beer Week, and enjoy the hell out of my Zwickel Licker, an unfiltered Dortmunder Export lager! You can get a sample taste of Jack's biere de vieux petard, too. It's all PAYG, and we'll see you there!